You watchin’ Netflix and eating Cheetos? I’ll make you a deal: turn off the Netflix and watch the fourth instalment of The Landing Page Sessions instead. Don’t worry, you get to keep the Cheetos. If you’ve been living under a proverbial rock (or a literal one for that matter) and haven’t heard of The Landing Page Sessions, let me enlighten you: they’re short 15- to 20-minute videos, each dissecting a real-world marketing campaign all the way from the referring ad or email to conversion. And they’re starring none other than Brad Pitt Oli Gardner, Unbounce Co-Founder and landing page savant. By showing you how to improve real-world campaigns, Oli takes the high-level theoretical blabber and turns it into actionable tips and tricks that you, too, can implement to improve your prospective customers’ marketing funnel experience. If, on the other hand, you did check out the first three episodes, you’re probably fiending for more — amirite? Well you’re in luck, because we’ve got another killer episode to feed your craving, and this one is all about the mobile experience. Cheap1300Number offers toll-free 1300 numbers at a low cost, but its mobile landing page is garbage. No, like, there’s an actual garbage can on the page — not exactly the hero we envision. 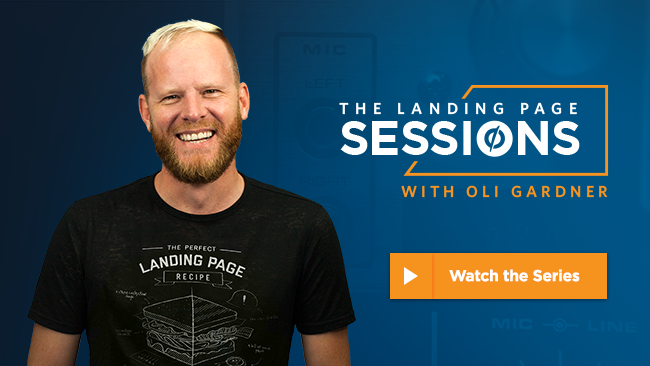 In this episode, Oli discusses hero images, the importance of a clear call to action and how to optimize a landing page for the mobile experience… all within the Unbounce landing page builder. And if you missed last week’s episodes and want to catch up (don’t worry, you don’t need to watch chronologically), go check ‘em out. And eat a Cheeto for me.